Are you tired of wringing your neck every time you want to clean your windows on both sides? With the Magnetic Window Cleaner, cleaning windows is much easier, faster, and safer! The Magnetic Window Cleaner is your new cleaning essential! You'll forget your troubles on cleaning your windows both from the inside and outside. This Magnetic Window Cleaner cleans your windows simultaneously inside and outside. So How's It Work So Well? The principle is simple: with its strong magnets, you can glide the second cleaner from the outside without sticking your hand out from the second-floor window. Double-sided squeegee technology on both the outdoor and indoor portions of the glider effectively spread around glass cleaning solution and then wipe clean all the unwanted dirt and grime. Tough, 100% natural rubber never breaks down, so you’ll enjoy fresh looking, streak-free windows again and again. 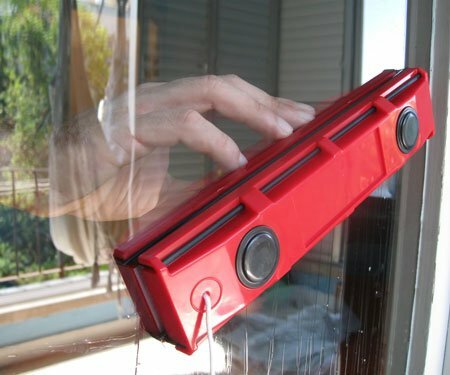 Allows you to clean the outside of your windows while staying inside your room. Effective for cleaning single glazing windows between 0.08" up to 0.3" / 2 - 8 mm thickness.